Alkyd based undercoat for enamel paints. Exceptional for the preparation of surfaces to be coated with alkyd based paints. 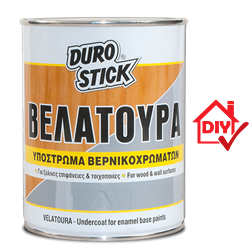 It has great coverage and strongly adheres on any wood surfaces as well as plastered wall surfaces. It works and sands easily. Apply it on new and/or existing, puttied wood surfaces (doors, windows). Apply it also on skimmed surfaces from marble based plaster and drywall. 1lt/10-12m² per coat, on properly prepared surfaces.